"Memorial weekend promises to be busy, filled with flags to fireworks." That's how the Standard-Examiner headlined this article about activities across the Top of Utah. Additional activities will be held all around the state, from Salt Lake to St George to Moab. Below are excerpts from the Examiner article. Flags, fireworks, military pomp and ceremonies to remember the dead will fill the Memorial Day weekend throughout Top of Utah. Veterans groups will place flags on the graves of veterans. Cemeteries will host special memorial services. Leavitt's Aultorest, 836 36th St., Ogden, is even displaying 1,000 American flags to commemorate the estimated 1,000 veterans, going back to the Civil War, who are buried in that cemetery. Aultorest is also putting on a Saturday night fireworks display. The annual observances at the Hill Aerospace Museum, 7961 Wardleigh Road, will include installation of another member of the Utah Aviators Hall of Fame and a special memorial in the chapel. The Salt Lake Tribune has this article, with this headline: "Twenty-five things to do if you don't have plans for Memorial Day weekend." It offers suggestions ranging from Veteran's Memorial Services to historic reenactments to family recreation. Utah has just finished installing 35 new welcome signs at interstates, highways and visitor centers across Utah. Images on the signs vary depending on the location, depicting prominent attractions in that area including Zion National Park, Arches National Park, the Salt Lake City skyline, skiing, dinosaurs, and the Golden Spring National Historic Site. The signs are built around the "Life Elevated" slogan. KSL has this news article about the change; the report includes a video clip and images of the signs. Below are excerpts. "Welcome signs are the front porch of our state," said Leigh von der Esch, the director for Utah's Office of Tourism. In all, there are seven different welcome sign designs, depending on where you enter the state. In the northern part of Utah, you'll see either the downtown Salt Lake City/Wasatch Front design, or the popular welcoming of the railroads/Golden Spike design. The southwest part of Utah has a Zion National Park design. The southeastern section of Utah has either the Arches National Park/Delicate Arch design, or a design of Lake Powell. The Vernal and Flaming Gorge area has a dinosaur for its design. Coming into the state near Park City and Bear Lake will feature a Ski design. All of the designs feature Utah's brand "Life Elevated." That rebranding effort began in 2006 and has helped boost visitation and tourism spending from $5.7 billion in 2005 to $6.2 billion in 2009. The new signs replace the 2002 Winter Olympics design, which has been in place for 11 years. "Although we still maintain our position as the ‘Crossroads of the West,' we are now becoming a destination," said Herbert. "A picture is worth a thousand words, and so these welcome signs as a picture of what Utah is about [are] going to go a long way toward encouraging tourism and promoting people to come to Utah." Utah's highways, campgrounds and recreation areas are expected to be busy this weekend, as people go outdoors to celebrate the Memorial Day holiday and the unofficial beginning of summer. However, some high elevation facilities will not be open because there is still heavy snowpack in those areas. Cedar Breaks National Monument, the Alpine Loop and the Mirror Lake Highway are still closed, along with other attractions at similar elevations. The Salt Lake Tribune has this article previewing conditions for the weekend. Below are excerpts. At Cedar Breaks, snow has covered buildings and delayed the opening of the scenic highway leading to the visitor center. "On [May 21] there was a wall of ice and snow 10 feet high at the visitors center," said Cedar Breaks spokeswoman Teri Saa on Tuesday. "We had to chip away and make a tunnel to get to it." ...U.S. Forest Service spokeswoman Kathy Jo Pollock said most lower-elevation campgrounds are open. But higher-elevation campgrounds, roads and trails might be muddy and visitors are encouraged to drive on dry surfaces only. She said most backcountry hiking and camping is still limited because of snowpack around the state. Campers probably will start noticing snow still on the ground at about 8,500 feet elevation. Pollock said the popular Alpine Loop in Utah County will remain closed through the weekend and the Mirror Lake Highway in Uintah County is also closed at higher elevations with only four lower elevation campgrounds open. State Road 39 between Ogden and Woodruff also remains closed. Saa said the park (Cedar Breaks) might open by June 5 if plow crews can clear both lanes of the highway. She said the snowpack also could delay park activities including a wildflower festival that normally begins with the Fourth of July. And the campground opening could be delayed. Campers should check with the park before they visit. "It should be a spectacular season for wildflowers, which usually begin to bloom in early July and may run a bit later this year due to the late snowfall," she said. Kenton Call, spokesman for the Dixie National Forest in southern Utah, said snow will delay the openings of the popular Duck Creek Campground east of Cedar City off SR 14 and the campground at Panguitch Lake off SR 143. The campground at Navajo Lake off SR 14 is also closed. Call said closed roads will be posted, and he asked for the public's cooperation in respecting the closures. Yesterday's storm produced the latest measurable snowfall ever at Salt Lake International Airport. See Snowbird's late spring/early summer schedule. KCPW has this news report about Snowbird's extended season. Below are excerpts. Snowbird has the longest ski season in the state and is the only resort still open. This year, the slopes will remain open until June 20, for a total of 199 days. That’s just two days short of the longest Snowbird season on record. The 2004-05 season extended to July 4. The Utah Office of Tourism and the Utah Department of Transportation have teamed up to sponsor a "Stay and Extra Day" promotion, to entice travelers to stay longer after summer holidays. The program features discounts at popular businesses in many Utah destinations. UDOT summarizes the program this way: "UDOT has partnered with travel venues and attractions across the state to offer discounts and incentives to travelers to extend their summer weekend vacations. Each offer is based exclusively on the Thursday or Tuesday surrounding the Memorial Day, Fourth of July, Pioneer Day and Labor Day holidays and/or on a Thursday or Monday for any other weekend this summer. "The 'Stay an Extra Day' promotion will help reduce the number of vehicles traveling during peak travel times, as well as bolster in-state tourism by encouraging extended stays. Travelers can take advantage of these great offers by viewing the details below and then contacting the destination directly." UDOT has this list of participating businesses, with specific info about the deals they offer. Many participating businesses offer discounted or free lodging; some also offer discounts on activities ranging from golf to sailing to rafting. Utah roads that are closed during the winter are now being reopened to allow access to campgrounds and other facilities that are popular during the summer season. The Utah Department of Transportation provided info on the roads listed below. These are important secondary roads that are closed during winter because of deep snow. Many gravel roads in high-elevation forest areas are also closed during winter. Some are already open and others will open during the next few weeks. Check with the Forest Service Ranger Districts for information about roads in areas you want to visit. The annual Moab Arts Festival will be held over Labor Day Weekend (May 29-30) at Swanny City Park in Moab. The festival draws artists and art enthusiasts from around the region. There will be an arts & craft show, jewelry, pottery, wood items, sculpture, clothing, fine art, photography, kid-o-rama, music, entertainment, taiko drummers, a food court and more. The park is located at 400 North 100 West, in Moab. For more information, see the festival website or call: 435-259-8825. White there, this is the perfect time of year to take a whitewater rafting trip, ride mountain bikes or explore 4-wheel-drive routes. The Cedar City and Brian Head areas offer numerous attractions that are sometimes overshadowed by the popular nearby national parks. To help people learn about this area, the Cedar City-Brian Head Tourism Bureau offers "Discover Your Own Backyard" tours to highlight historic and outdoor sites, as well as entertainment options. Recently the bureau opened the tours to the general public. The Spectrum has this article about the tours, which includes a schedule and contact information. Below are excerpts. A tourism program that started as a way to familiarize outside media with Iron County has grown in the last two years to also help area lodging proprietors attract guests and residents fill a Thursday afternoon with something besides their daily routines. So far this year, the tours have taken groups of approximately 15 people each week to sites like Frontier Homestead State Park, historic downtown Main Street, Three Peaks Recreation Area, Parowan Gap and Old Irontown. 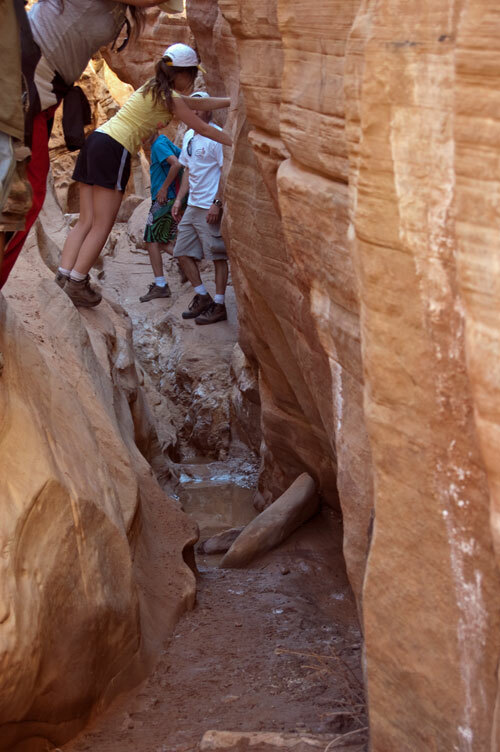 As the weather warms up, hikes to area slot canyons and trips to Cedar Breaks will also be included, as well as backstage tours of both the Utah Shakespearean and the Neil Simon festivals. "I've been to Parowan Gap many times and biked the entire area, but I had no idea there were dinosaur tracks," (Richard) Burchby said. Spring runoff started in earnest on Monday, when air temperatures climbed into the low 80s F in many areas. Today a rainstorm brought lower temperatures, and that will slow runoff a bit, but the reprieve will be brief because temperatures will warm again later this week. Stream flows are expected to peak around May 27. People involved in recreational activities in Utah need to pay attention to the flows because they pose a danger. But high flows also bring opportunity for whitewater rafting adventure – many people like to ride the crest of the runoff on fabled river sections on the Colorado, Green, Yampa and Delores. High water means river trips can be more intense in places like Westwater, Cataract and Grand canyons on the Colorado River. As runoff ends, the river water warms and rafting conditions become more pleasant, albeit not quite as exciting. The rivers then settle into a summer pattern and offer great recreational opportunities into early fall. In northern Utah, streams are running high and fast, and the water is very cold. If a person inadvertently slips into the torrent, he or she may be in real danger. Parents are encouraged to watch kids closely while near waterways, and not allow kids to play on stream banks. Stream fishing is popular in Utah and fishermen need to use caution. In addition to high water, runoff brings mud into streams and that can reduce fishing opportunities. However, this year runoff is not expected to be particularly bad and most streams will probably remain fishable right through the period. Our famous blue-ribbon fly fishing stream sections are protected from major runoff because they are located below dams, which capture and store the high water. The Green River below Flaming Gorge and the Provo River below Jordanelle and Deer Creek reservoirs will probably offer very good fishing through the spring and early summer. The Standard Examiner has this article about runoff. Below are excerpts. A spike in temperatures means Utah's mountain-fed rivers and streams are quickly swelling -- some tripling in volume in a matter of days -- and raising the risk for those who go near them. He's warning parents to keep youngsters away from fast-moving streams. Each year, he said, children fall into and drown in Utah's frigid, mountain rivers. The danger is not just that the water is moving fast through rocky areas but also that river temperatures can be in the mid-30s, and hypothermia can set in within minutes, Hutson said. Dangerous conditions are expected to remain until early June. The Weber River near Oakley -- like similar rivers in the Wasatch range -- is expected to triple its water between now and the end of the month, McInerney said. Despite that, flooding isn't expected this spring. That's partly because Northern Utah got less snow than average over the winter. Storm systems in March and April helped, McInerney said, but the northern mountains are still lagging behind the 30-year average. Conditions are perfect right now for all kinds of outdoor adventure. I camped and hiked over the weekend and the weather was incredibly nice. My group included some people who had never camped before and we had a great time. We camped in the Temple Mountain area, getting off by ourselves in a remote spot where we had room to breath. Our closest neighbors were about half a mile away. We grilled hamburgers and hot dogs, cooked a Dutch oven cobbler and made smores by roasting marshmallows over the campfire. Food was tasty, and that always helps when you are introducing newbies to camp life. Temple Mountain is close to Goblin Valley State Park and some of our group spent half a day exploring there. They loved it. The Temple Mountain area offers great mountain bike and ATV routes, along with outstanding hiking trails. We went with foot power and did an adventure hike into Crack Canyon, introducing some of the group to the sport of canyoneering. They did very well – some said that was their favorite part of the trip. Temple Mountain is a popular recreation area located on the edge of the San Rafael Swell. It is managed by the BLM (Bureau of Land Management) and there is no charge to camp or play in the area. There are vault toilets in two spots near the mountain, but not water and no services of any kind. You've got to be self-sufficient when you venture into this area. Slickrock extends in every direction and the area offers virtually unlimited opportunity for adventure. BLM areas in Utah include land that was basically left over after the homestead era. In many spots the landscape is mostly dry, barren rock – very little dirt – and so the land won't sustain farms or communities. But these areas that nobody wanted a few decades ago have become very popular for recreation. At Temple Mountain and some other spots, the scenery and recreational opportunities rival those found in our national parks. Right now is the perfect time to camp and explore Temple Mountain, the San Rafael Swell and other desert areas. As a hobby, I seek out and photograph ancient Native American rock art. I've collected hundreds of images over the years. I enjoy the glimpses they provide into the lives of the people who made them, sometimes many thousands of years ago. Often I hike to find rock art. I enjoy traveling into remote areas and hiking, searching, following the clues to discover new images. Last weekend I visited an amazing panel of figures, located along a paved road near Vernal in eastern Utah. Called the 3 Kings Panel, the images are beautiful, sophisticated and highly unusual. The images obviously tell a great story, but we don't understand many of the details. Who were these kings, so proud and elegant? Why are they watching over this pastoral valley? Many rock art images are simple stick figures, vaguely resembling humans or animals or fanciful creatures. Others are incredibly detailed, intricate representations of animals, men, gods and demons. Sometimes we aren't sure which are which. Are the 3 Kings mortals or some kind of deity? Ongoing research will reveal more about the figures, and the culture that created them. The images provide important clues to help us understand human history, to help us understand ourselves. The images are on private property but are open to the public for viewing. So far the public has shown respect and restraint, for both the images and the rancher's property. Hopefully, that will continue and the area will stay open to the public. On my list, the 3 Kings rank among the top 10 rock art panels in the US. They are treasures. To see them, travel to the town of Vernal and then get onto 500 North Street. Follow that street west to 3500 West Street. Turn north and follow 3500 West to the McConkie Ranch Road. It is about 6.4 miles from the 500 N/3500 W intersection to the ranch road turnoff. As you follow 3500 West it becomes the Dry Fork Canyon Road. It is also known as the Red Cloud Loop Road. A sign clearly marks the turnoff to McConkie Ranch. Follow the McConkie Ranch Road for about 1/2 mile to the signed parking area. All these roads are paved. Utah's state parks are a bargain, when you consider the quality of the recreational opportunities they offer. The state has made every effort to keep costs low. Occasional fee adjustments are necessary, and some have just been implemented. Utah State Parks provided the news release below. Salt Lake – Sand Hollow, Quail Creek, Gunlock, Anasazi, Hyrum, and Bear Lake state parks implemented fee changes effective May 1. Day-use entrance fees, per vehicle with up to eight occupants, are $10 at Quail Creek, $7 at Gunlock, and $5 at Anasazi. 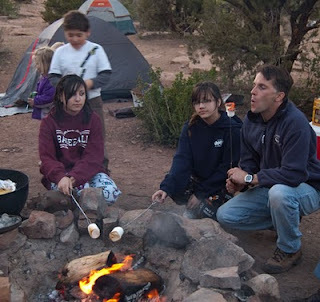 Individual campsites are $13 per site at Gunlock. Quail Creek campsites are $15 with a $12 extra vehicle fee. Sand Hollow Westside Loop is $28 and $15 for an extra vehicle; Sand Hollow Sandpit Loop campsites with utilities are $25 per site with an $18 extra vehicle fee. Primitive area camping at Sand Hollow is $15. Group camping at Hyrum is $200 per night. Willow and Big Creek group sites at Bear Lake State Park are $100 per night and boat camping transient slips at Bear Lake are $20. Your park fees provide for care, protection and enhancement of Utah’s state parks. For more information, please call (801) 538-7220. Joel Racker from the Utah Office of Tourism has created his “Utah bucket list” of experiences everyone should have before they check out of this life. He gives details here. Below is an abbreviated list. Marsha Maxwell blogs about Utah on about.com. She didn’t much like Joel’s list and so she came up with one of her own. You can see it here. Below is the short version. Me, I’m more in line with Marsha. Only I’d change two to bring in a little more adventure. The famous Quarry at Dinosaur National Monument is closed while it is being rebuilt. It will probably reopen during fall of 2010. When that happens it will again be one of the great places in the world to view and learn about dinosaurs. Until then, where can people go to view dinosaur fossils? Is it worth taking a trip to visit the national monument? I explored the monument last weekend and had a great time. 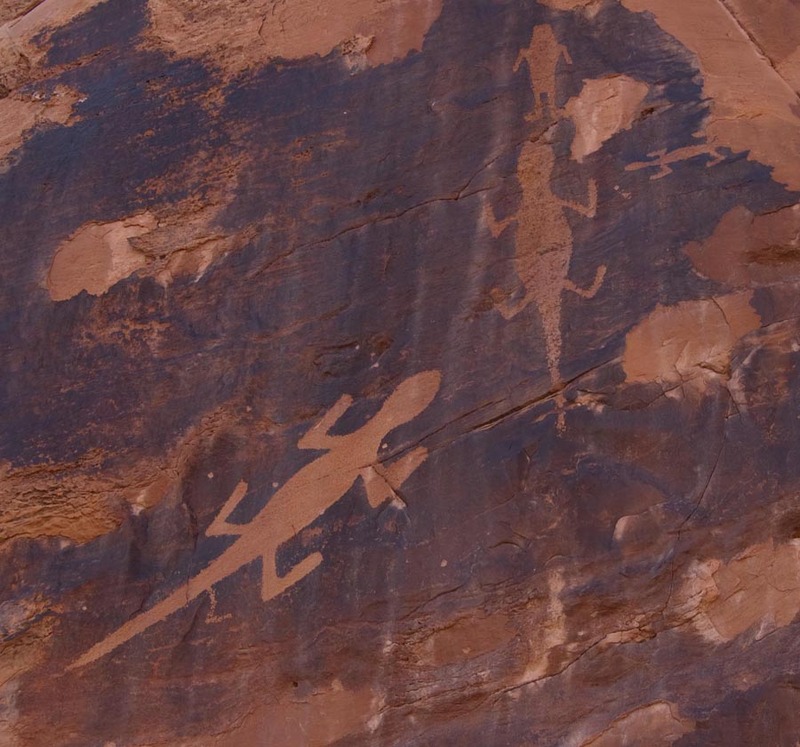 I found large dinosaur fossils, shot photos of ancient Native American rock art and hiked into the park’s backcountry. At the end of the trip, I wished I had more time to spend there. Now I’m anxious to go back. I stopped at the visitor center to get current information and the people there told me about the Fossil Discovery Hiking Trail, which is located near the Quarry. The trail follows along a wall where you can see fossil bones protruding from the rock. As I hiked I saw large leg bones and one obvious spine. Rangers guide hikers along the trail on a daily basis. Check at the visitor center for times. I am fascinated by ancient Native American Rock art and I have long known there are several important rock art sites within the national monument. On this trip I sought out three and was able to get some great photos. I didn’t camp on this trip, but I stopped by the Green River Campground and was impressed by the setup there. The campground was not crowded, even on a beautiful spring weekend. It offers very nice facilities in a scenic area. Dinosaur offers great hiking trails and excellent opportunity for whitewater rafting trips. Yeah, the Quarry is closed but there is still much to see and do at Dinosaur National Monument. I’ll be back to explore deeper into the backcountry. It is one of the great places in the world where you can find solitude in an incredibly scenic area. May 10 marks the anniversary of the “driving of the golden spike,” completing the first US transcontinental railroad. Historians say the completion of the railroad essentially ended the frontier period in American, and soon tamed the wild West. Reenactment ceremonies will take place at Golden Spike National Historic Site, in northern Utah. The Deseret News has this article about the events. Below are excerpts. The Golden Spike National Historic Site will present two special events next week in recognition of the Golden Spike's 141st anniversary. The visitors center opens at 9 a.m. There will be music and dance prior to the traditional program, which will begin at 11:30 a.m. The keynote speaker will be Kyle Wyatt, historian at the California Railroad Museum. In a separate event, Dennis Lewin, a retired Union Pacific railroad telegrapher, will be presenting a program on the use and history of the telegraph on Saturday, May 15. He will focus on the application of the telegraph as it was used by the railroad. The program will be held at the visitors center interpretive shelter, with the first demonstration at 10 a.m. and others continuing throughout the day until 3 p.m.
Moab is famous for adventure activities like mountain biking, jeeping and whitewater rafting. We've long known that it offers some of the world's best adventures. It is nice to see that readers of tripadvisor.com agree. The annual Old School Rock Crawl will be held May 13-15 in Delta, Utah. Rock crawling is a unique sport where modified 4X4 vehicles climb up and down incredibly steep obstacles, sometimes getting stuck or rolling in the process. Metal smashes against rock and rubber burns in an event that is exciting, even when the vehicles move along at 2 miles per hour. Clay Egan, a professional rockcrawler and wheelchair athlete, will be in this year's event. He will also give a presentation on Friday, May 14, 7:30 pm, as a benefit for Taylon Moody. Details. I was at last year's event and had a great time. This year promises to be bigger and better than ever. We shot a video last year, you can see it on the Millard County website. That site also has more info about the event. Some of the world's most prolific dinosaur sites are located in eastern Utah, where ongoing research and excavation provide new clues about the fascinating creatures. The College of Eastern Utah provided the news release below, concerning a dinosaur dig near the town of Price. 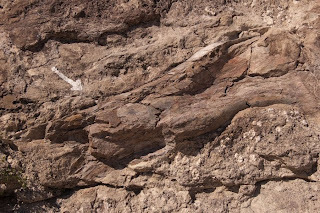 PRICE, Utah — The College of Eastern Utah Prehistoric Museum recently discovered a partially articulated dinosaur on Bureau of Land Management (BLM) land in eastern Utah. A nearly complete theropod (meat-eating) dinosaur will be excavated through a collaborative effort between the College of Eastern Utah Prehistoric Museum and the Bureau of Land Management Utah Price Field Office. This effort will provide a unique opportunity for the public to observe an active dinosaur excavation. The public is invited to visit the excavation from Tuesday, May 4th through Saturday, May 8th. The site can be accessed from a graded, gravel road close to Price, Utah. Beginning on May 4, maps with driving directions may be picked up during regularly scheduled museum hours (9:00 a.m. to 6:00 p.m., seven days a week) in the lobby of the CEU Prehistoric Museum, located at 155 East Main Street, Price, Utah; or 8:00 a.m. to 5:00 p.m., Monday through Friday, at the BLM Utah Price Field Office, located at 125 South 600 West, Price, Utah. This discovery exemplifies the rich paleontological region surrounding the College of Eastern Utah Prehistoric Museum. Following excavation, the dinosaur will be prepared at the museum, where the public will also be able to observe the preparation process and speak directly with the fossil preparators. After excavation and preparation, the dinosaur will remain at the museum where it will be available for further study and research. The College of Eastern Utah Prehistoric Museum creates understanding and appreciation of natural and cultural processes that formed the geologic, fossil and prehistoric human records found in eastern Utah. We do this through educational and interpretive programs based upon our academic research, preservation programs, authentic exhibits, and the creative efforts of our staff and community. The BLM manages more land – 253 million acres – than any other Federal agency. This land, known as the National System of Public Lands, is primarily located in 12 Western states, including Alaska. The Bureau, with a budget of about $1 billion, also administers 700 million acres of sub-surface mineral estate throughout the nation. The BLM’s multiple-use mission is to sustain the health and productivity of the public lands for the use and enjoyment of present and future generations. The Bureau accomplishes this by managing such activities as outdoor recreation, livestock grazing, mineral development, and energy production, and by conserving natural, historical, cultural, and other resources on public lands. Utah Valley, home to Provo City and Brigham Young University, has used the slogan “Adventure Awaits” to try to entice visitors to stay and play in the area. But CVB leaders think the slogan has run its course and is ready for retirement. The replacement: “Utah Valley: Bring everyone together”. The Provo Herald has this article about the change. Below are excerpts. "When you're looking at branding, I think you look at what space you can own," UVCVB president Joel Racker said. "No matter how much money we can throw at 'Adventure Awaits,' we are not going to own that space." But meeting family and friends for The Church of Jesus Christ of Latter-day Saints Women's Conference, or Brigham Young University football games, or graduations? The county has that covered. The new branding strategy is the culmination of two years' work with UVCVB's advertising partner, Farmington-based thomasARTS. Though the "Adventure Awaits" approach has served its purpose, research interviews with 600 business and community leaders as well as 600 out-of-towners suggested the gathering aspect was stronger. The hiking, biking, fishing and climbing are still draws to the area, but the valley might be better served playing up the low-key activities. New brochures will likely include photos of down-home folk enjoying the Spanish Fork Festival of Colors, or the Timpanogos Storytelling Festival, or the Thanksgiving Point Tulip Festival, emphasizing the practical gathering appeal of Utah County, including its proximity to Interstate 15, Salt Lake City and Sundance Resort. One of the selling points this year, for instance, is UVCVB's new Par Pass, a partnership between the bureau, local hotels and all 11 public golf courses in the county. For $45, anybody (though business travelers are the target market) can play 18 holes at the course of their choosing, including a 30-day advance tee-time reservation. The UVCVB revamp is interestingly timed, considering Portfolio.com rated Provo the least fun metropolitan area in the country last week. Racker wants to invite the editor of Portfolio to town for a follow-up to change his mind. Then again, Utah Valley isn't trying to be Las Vegas or New Orleans, he said. The 2010 HANNspree Superbike World Championship Utah USA Round will be held May 29-31 at Miller Motorsports Park, located in Tooele, about 30 minutes west of Salt Lake City. The event is very popular; it is the only appearance in the Western Hemisphere for World Superbike. Some 400-plus volunteers are needed to ensure it will be a successful, safe and fun event. See the Miller Motorsports Park website for more info about volunteering. Roadracingworld.com has this article about the need for volunteers. Below are excerpts. Volunteers are needed to serve in the following capacities: Flag Marshals, Track Marshals, Volunteer Coordinator, Logistics and Hospitality Host/Hostess. A great incentive package has been created for volunteers who want to be a part of the only appearance by the Superbike World Championship in the western hemisphere. The package includes free camping; free breakfast, lunch and dinner for all three days; and daily incentives, include t-shirts, hats, water bottles, raincoats, race tickets, discounted tickets for the Saturday-night concert (Foreigner, Styx and Kansas), and a thank-you dinner and gift to wrap up the weekend on Monday, May 31.